Really nothing fanciful, my pasta dish was just one of the many versions. Of course, with a twist to adapt the pasta cooking as my own. (1) To cook meatballs: Mix minced meat, tuna, mashed biscuits, chopped onion, all-purpose seasoning powder and pepper, with bare hand. While mixing the ingredients, slowly mix in milk. Set aside to season for at least 30 minutes, or keep in refrigerator up till overnight. (2) Shape minced meat mixture into table tennis ball size. Heat large frying pan with olive oil and butter over low fire. Add fresh Rosemary and sauté till aroma releases, discard it before adding meatballs. Sauté all meatballs until golden browned. Heat off and dish up. ^Retain the remaining butter oil in pan for cooking pasta sauce. (3) To cook pasta: Boil a large pot of water over medium fire. When water is rolling boiled, add pasta and cook for 8 minutes, or until al-dente. Drain and transfer into serving bowl. Drizzle olive oil and salt, mix well. Set aside. ^Retain some of the pasta water for sauce cooking. 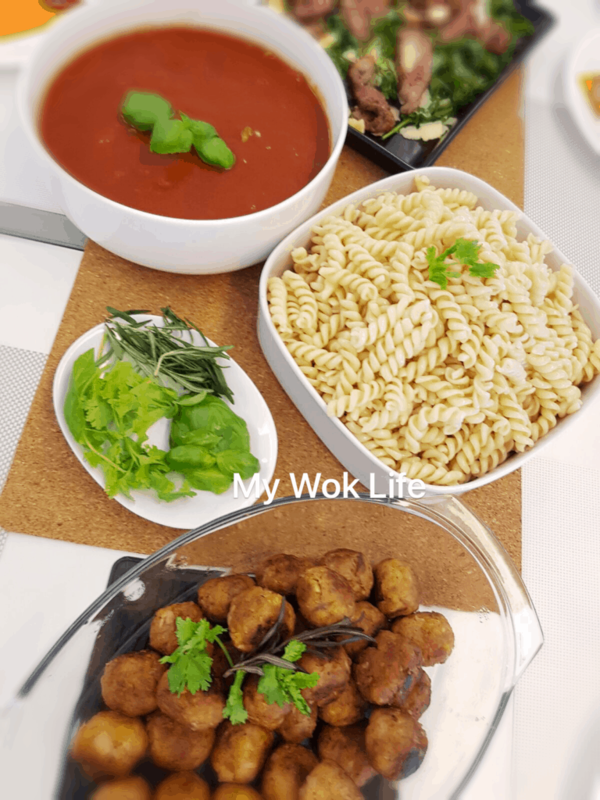 (4) To cook pasta sauce: Use the same frying pan of sautéing meatballs. We want the same butter oil for this. Heat the pan up over medium low fire. Add onion to sauté till fragrant and slightly browned. Add chili padi and stir fry a little. Add mushroom, sauté till soften. (5) Pour in tomato purée. Add 2-3 scopes of pasta water, sugar, chopped sweet basil and cherry tomatoes. Stir to mix well. Let it simmer for awhile, heat off. Serve hot with pasta and meatballs. 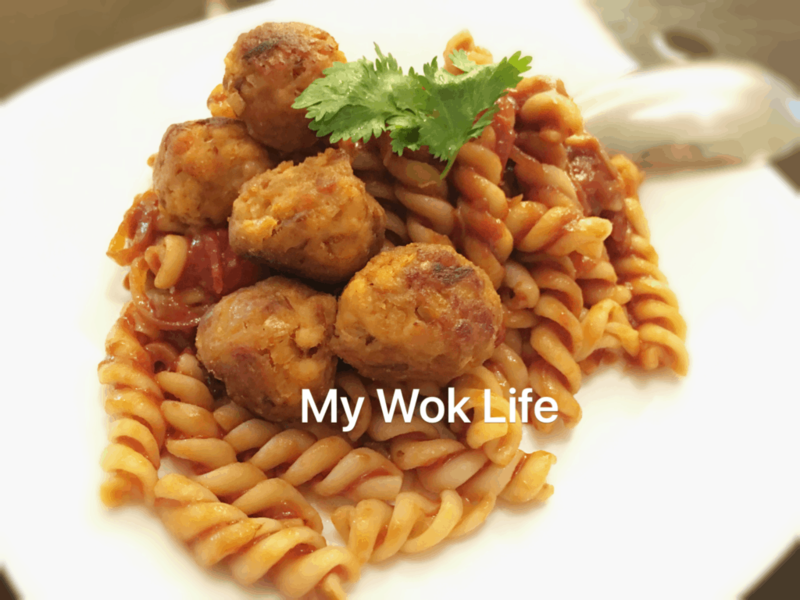 A large serving of my spicy tuna meatball pasta counts about 500kcal. Tips: All-purpose seasoning powder is available at major supermarkets e.g. NTUC Fairprice, Cold Storage, Giant Hypermarkets and online grocery stores. Look ard the condiment/ seasoning shelves. However, it’s ok to replace with some chicken powder, if really really found it at no avail. * Any excessive meatballs can be stored up to a month in freezer for future use. * Add 1-2 more scopes of pasta water into the sauce cooking, if you prefer more diluted pasta gravy, and vice versa. * I used canned Hunt’s organic tomato purée. It’s available at major supermarkets. 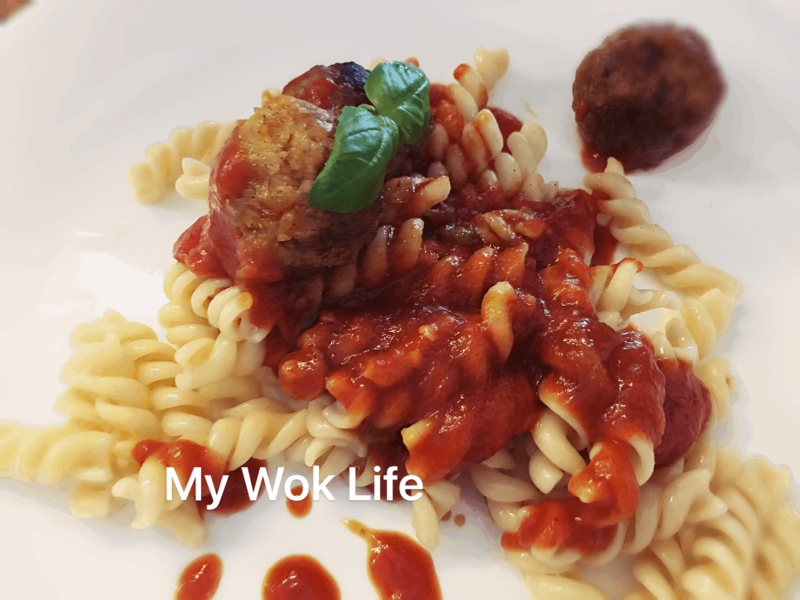 * I used spicy tuna or kimchi spicy tuna for my meatballs. For non spicy version, use olive oil tuna. Canned tuna is available at major supermarkets and grocery stores. * Soda biscuits to be mashed into fine crumbs. For more interest bites, coarsely mash the biscuit to leave some biscuits bits. ^Do not discard the oil from sautéing meatballs. Use it for cooking pasta sauce. ^Do not discard the water from boiling dry pasta. Use it for cooking pasta sauce.